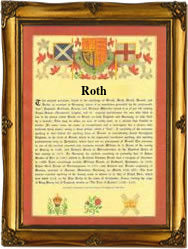 Recorded as Roth, Rothe, Rother, Rothert, Roiter, Roter, Rotheman, Rothman, Rothmann, Rottmann, Roitman, Reitman, and others, this is a surname of English, German or Jewish origins of which it has at least four. The first and most likely is from the pre 7th century word "rot" meaning red, and hence probably an ethnic name for an Anglo-Saxon, people who were often red haired. The second is topographical and like the surname Rhodes or Rodes, is a development of the early word "rod" meaning a wood, and hence a dweller at such a place. Thirdly it can be from the German word "hrod" meaning renown, and often used as a prefix of other names, whilst fourthly it can be Jewish. As very few people of Jewish origin are red haired, it has to be assumed that the name is ornamental. That is to say in the 18th century when many refugees of Ashkenasic origins fled to Germany from the Balkans and the Turkish Empire, they were given pleasant localalised names, of which this is known to have been one. It is unclear when the surname was first recorded, but as Rote it appears in Germany in 1138, whilst in England John Rotheman appears in the tax rolls of the county of Essex in 1327, and Adam Roth in records of the city of Colchester, also in Essex, in 1346.